I've come across some threads in social media lately, asking why it is that no major innovators have emerged on the new jazz scene today. A good answer by I-forget-who was that the scene has changed so that there is important work being done, but that none of it has been centrally confined to a few major figures. It is true. Part of that is a product of so much new jazz having become available these days via a combination of numerous smaller boutique labels, self-releases and the major jazz conduits. There are local hotbeds of progressive jazz and improvisation all over the world right now, with a sizable number of artists advancing the music in slow increments perhaps, but at the same time codifying and synthesizing the implications of major and some rather obscure artists who have helped make things the way they are now. It is true in general also of modern classical composers and avant rock artists. The promotion of the next big thing is no longer a priority with the moneyed music business interests as a rule, and that is not necessarily a bad thing. Absolute hegemony in modern music scenes would kill off much of what is excellent out there that did not fit the bill of the would-be big avant stars of the present. And perhaps it is so that the mainstream audiences for such things is no longer very large, though one might argue all-the-more dedicated. Much of new jazz is an underground affair. The available work in clubs and concerts has shrunk a good deal in the last 30 years, making it necessary for hyper-local scenes to remain relatively isolated and insular. Like the old territory bands, there are sub-genres in new jazz, quite a few if you take the time to locate them. All this is probably a good thing for the quantity of good-to-excellent new jazz emerging out there. It is decidedly not a very good trend for the economic health of the artists. With all this in mind I turn to a recent release that exemplifies the importance of new jazz along with its sometimes obscurity. Here we have Abstract Window (WhyPlayJazz RS032), featuring drummer Kasper Tom Christianson, pianist Alexander Von Schippenbach and clarinet-bass clarinet master Rudi Mahall. It is a European free date that allows a very creative and spontaneous frisson of eloquent free invention from three important figures very much active today. 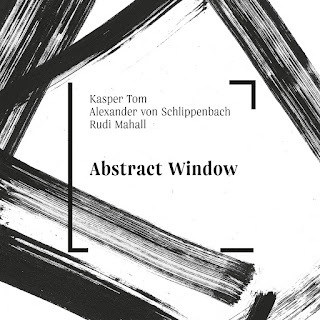 Kasper Tom may be less known but he shows us he is fully worthy to be in the company of these two stellar artists. The program consists of 11 relatively short improvisations that cohere in the best senses of what the jazz-past-drenched realm of freedom in Europe means today. All three are in mutually coherent dialog throughout, each responding on a three-way channel of independence-through-togetherness synchronicity. It is an exciting example of one subrealm of free improv jazz that continues to grow and evolve today. More you will understand if you give this album some deep listening. It is in its own way landmark.